Sasquatch DNA: A Red-Haired Sister to Humans? DNA evidence has gotten felons off death row. Could it be about to get Sasquatch onto the list of newly discovered species? 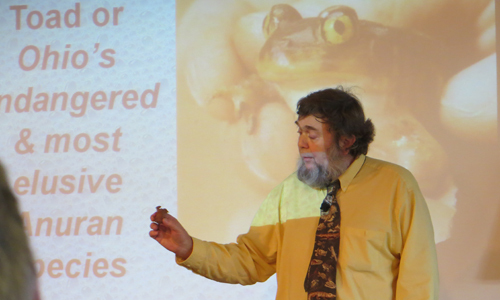 Dr. Scott Moody has been teaching and researching various topics of biology at Ohio University for 35 years. 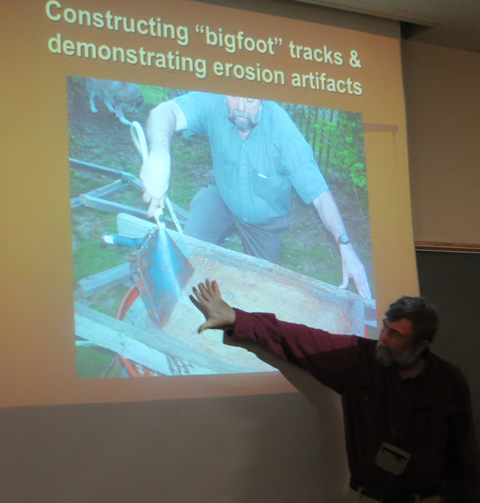 For the last 15 years or so, when he took over the forensic biology course, he’s been looking at Bigfoot evidence—from a scientific perspective. 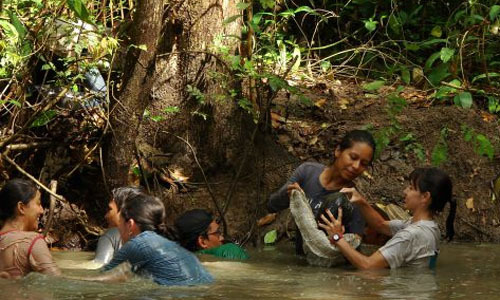 “I did open up my scientific mind and started looking at the evidence,” says the Associate Professor of Biological Sciences. He’s given the talk on Sasquatch many times, but on Wednesday he updated it with an announcement from the Sasquatch Genome Project. Hoaxes and fakes may have clouded the picture—and kept many scientists from looking at the facts, but DNA research published this week claims to identify a new relative of Homo sapiens. Despite the fact that it was rejected by peer-reviewed journals, the DNA evidence could tell the tale of a new species. Would 10 lab scientists put their names on a report of dubious origins? Is it even possible to fake DNA evidence? “Sometime in the past, a female human mated with a different ape species, and all of the Sasquatches are descendants,” concludes the published DNA report. 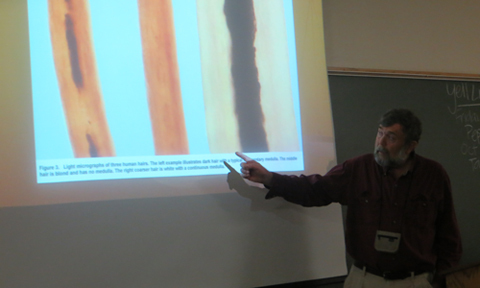 Dr. Scott Moody shows light micrographs of three human hairs. Scientists don’t “believe” in things, Moody says, not even gravity and evolution. They investigate and test hypotheses with evidence and assess the probability of truth or falseness. When 18th century Swedish botanist Carl Linné developed the modern system of classification of plants and animals, he included a “four-footed, mute, hairy wild man” category, a description that persists in European and Asian legends of a feral or wild human. A 16th century manuscript from Germany, pictographs on the Tule River Indian Reservation, and other historical records tell a compelling story. But today’s researchers have a plethora of scientific tools to put Bigfoot to the test. It can be pretty easy to explain some sightings, says Moody, who has been called upon to investigate Ohio claims. Sorry, folks, if you were hoping for Bigfoot in the woods around Athens. Those toe-like footprints were caused by rainwater washing around pebbles in the clay, he demonstrated. That white creature attacking a bird feeder—a white-tailed deer standing on its hind legs, according to the hairs found on the feeder. Overlay a map of the Bigfoot sightings with a map of the influx of black bears back into Ohio’s regenerating forests, and, yep, they align pretty well. And unlike the temperate forests of the Pacific Northeast, Moody notes, Ohio’s forests also might not have the biodiversity necessary to feed Bigfoot. What about Film and Photographic Evidence? When Ray Wallace died, he instructed his family to release the evidence of his 1958 hoax film from a logging camp in Northern California, notes Moody. Recent additions to the video record include trail cams, with some video attributed to black bears with mange, yet clouded by extremity analysis of proportions and bears. “We haven’t found any films to just scream out and say this is the real deal,” he says. But a recent paper by Bill Munns and Jeff Meldrum looks at another popular film—the Patterson film of 1967—analyzed from the perspective of suit vs. body and how fat folds and muscles ripple and whether the motion shows fat adhering to skin or a costume hanging on a body. The evidence indicates subcutaneous adipose tissue adhering to a body, not a body inside a furry suit of fabric. “Therefore, I think the Patterson film is authentic,” Moody notes. There are now 26 distinct species of hominids described scientifically since diverging from a common ancestor with the chimp-bonobo clade. Good candidates for Sasquatch include Homo erectus, Paranthropius boisei, Flores man (which only died out 3,000 years ago), and Gigantopithecus blacki (extinct for a million years or so). Dr, Scott Moody shows his demonstration of how “footprints” were made by water erosion around pebbles. But easy answers are not the case for some of the evidence, including the newest tool in the scientific kit—DNA analysis. Footprints are pretty easy. Discerning a print made by someone wearing a piece of wood cut in the shape of a big foot can be told from an actual print made by an animal whose foot bends flexibly while walking, for example. But would a hoaxer at a time before fingerprint analysis became the stuff of detective shows take the time to carve lines into his fake bigfoot before his trek in the woods? And would people reporting sightings of Sasquatch take the time to make sure that their estimates matched up with Bergman’s Rule of natural selection, which predicts that animals in northern climes will be larger and bulkier in order to protect against the cold weather while the same species living in more tropical environments will be shorter and thinner to deal with the heat. Yet, Moody showed, the reported sightings averaged together followed Bergman’s Rule. Bigger animals in the north, ranging to smaller estimated sightings in the south. No Bodies? No Skeletons? So You Don’t Believe? Don’t be so sure, Moody says. A Homo erectus foot bone on display at the Mexico City Museum can be aligned more easily with European and Asian Homo erectus than with human or other remains found in the Americas. The Loess Man found near Omaha in 1894 has the brow oft seen in Sasquatch depictions. “Did I ever find a black bear skeleton while hiking in the woods? Absence of evidence does not signify that that organism doesn’t exist,” Moody says. In a court of law, you need the body to prove murder, he notes. But scientists don’t always have a body; they have to work with the available evidence. Like hair. DNA: A Red-Haired Sister to Humans? Part of Moody’s scientific analysis of Bigfoot evidence involves hair analysis. He has been sent hair samples from multiple sites, but these were either clearly human or non-ape mammals. Three hairs sent to him from Canada collected from a shelter where a “bigfoot” was filmed were either wolverine or mink hair. Dr. W. Henner Fahrenbach, a retired anthropologist, has published on hairs coarser than human lacking medullas and colored reddish-brown. The microscopic features aligned the hairs closest to orangutans found in Southeast Asia, but these hairs came from shelters in wilderness forests of northern California. The hair samples in the DNA article released last week have characteristics similar those published by Dr. Fahrenbach. Research released this week by the Sasquatch Genome Project shows the mitochondrial DNA whole genome haplotypes are consistent with modern humans. The nuclear DNA in some samples possesed the melanocortin allelic variant for red hair, a common trait reported in sightings. But the nuclear DNA is not all human. “Their findings show a mitochondrial DNA link to humans. Keep in mind that mitochondria always come from the maternal lineage so these haplotypes are ‘human European or Asian descent,’” Moody says. “I’m 2.9 percent Neanderthal,” says Moody, who has had his DNA analyzed for ancestors. There needs to be further discussion of the rejection to justify further discussion of the research. Is it reasonable to reject the peer review process so easily? It is a key component of the scientific process. Dr. Moody was highlighting scientific inquiry using a provocative subject. Sir David Attenborough opined that the Pacific NW would be sufficient habitat for a large primate, that does not say that he “believes” in sasquatch, but for the possibility to continue inquiry. There will be no proof until voucher specimens (entire ones) are produced. That goes for Sasquatch, ghosts, and space aliens…devils, angels, and fairies included. Another case study illustrating abuse of the peer review method. Helicobacter pylori is a Gram-negative, microaerophilic bacterium found in the stomach. It was identified in 1982 by Australian scientists Barry Marshall and Robin Warren, who found that it was present in patients with chronic gastritis and gastric ulcers, conditions that were not previously believed to have a microbial cause. There were attempts to take away their medical privileges because many medical doctors refused the evidence claiming that bacteria couldn’t possibly live in the stomach. Years later both were awarded the Nobel Prize in Physiology or Medicine. the conception of sasquatch in the article above is close to what I imagine it to be except I am not an evolutionist and the person spoken of fits a description of a person spoken of in the Bible.. and this person had red hair…. I have encountered these “people” in two remote areas of the Cascades during my trips since 2009. Those that have been with me have also seen them. I have observed them as close as 30 ft from me recently since I have left them food in the past. I have heard them speak so I know they have a language. I never believed they existed previously. They have never threatened me in anyway and I think they are very curious of me now?? I do not attempt to photograph them or bother them in anyway. They leave me alone, I leave them alone. They follow me now when I am in their areas. They appear human to me. The males I have seen are approximately 7.5 ft tall and the females 6.0 ft tall. Have there been any big foot sightings where the big foot was mistaken for a naked man? We were driving north along the Northern California coastal highway two years ago when I saw what I thought then was a naked red haired man. There was an approximately 20 foot opening in a brushy bank along the highway where the highway department kept a tall mound of gravel in a clearing. Standing in front of the gravel mound was a naked red haired man standing quietly upright facing south. He was just standing there doing nothing. I told my husband I had just seen a naked red haired man and we didn’t think too much of it. But as I think back I am struck by the man’s quiet demeanor, almost “spaced out” and a very, very neutral effect. He didn’t look larger than a man and his shape didn’t seem odd. I did get the strong impression of red hair, and for a naked man, he didn’t strike me as “naked.” I wonder now if the red hair covered his body to the extent that I didn’t really get a strong reaction to “naked” as I think I normally would. Have there been any similar sightings?